My daughter portraying Miss Mary Bullitt in 2016 at Historic Locust Grove. There is something incredibly rewarding about taking multiple things you are passionate about and combining them. 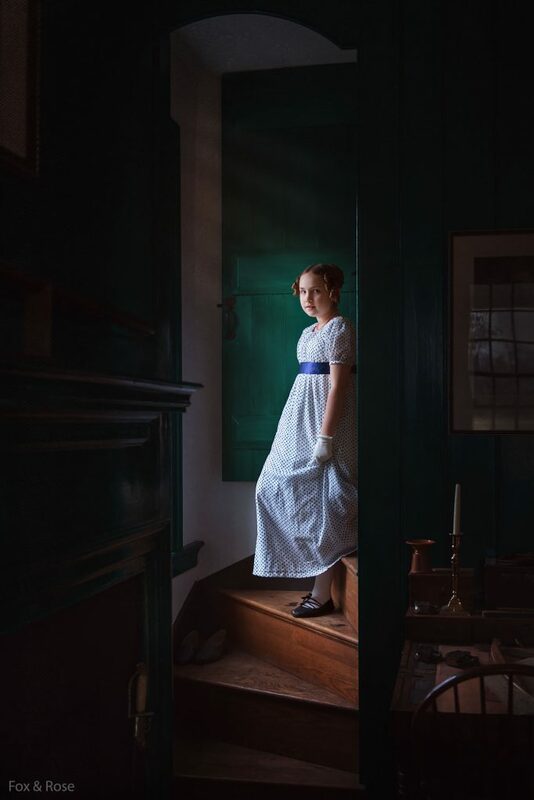 While I had been a photographer for a while before my family started volunteering at Historic Locust Grove, it was there where everything meshed together and my love of historically inspired portraiture was born. For me, there’s a bit of magic in using modern technology and careful research to create an image that brings the past to life and makes it feel more real. Toss in one of my children as the subject, and you get an image that tugs at my heartstrings and remains one of my favorite portraits that I have ever taken. One of the best things about this portrait is that it was a pure moment of serendipity. For the most part, I don’t go “behind the ropes” when there are costumed interpreter events in the historic house. I don’t want to ruin the atmosphere the interpreters work so hard to create by standing in the middle of them with a digital camera. I had made a rare exception and slipped into the back of the farm office to get some images of the interpreters interacting with guests during the 2016 Christmastide event. I had gotten a few shots I wasn’t fully happy with when I heard someone coming down the staircase at the back of the room. That back staircase is a bit steep so it’s really only used by interpreters during events to help keep the traffic flow less congested on the main staircase that’s used by guests. There also happens to be a nice sized window at the bottom curve of the steps that makes for a pretty pocket of light against the gorgeous verdigris door on the landing. So when I heard footsteps, I quickly turned 90 degrees and changed my settings in the hopes of getting something interesting. I was thrilled when it turned out to be my daughter that appeared in that pretty pool of light. I love everything in this picture. I love the delicious natural light. While I admit I may be biased, I genuinely think that’s prettiest verdigris I have ever seen. I couldn’t have captured a sweeter expression on her face even if I had actually staged the shot. I adore the block printed fabric of her dress. I love the little details and the frozen moment in time. I even love it down to my husband’s dancing slippers tucked away on one of the steps.